Water and sanitation access challenges are often thought of in the extremes—lack of a clean water source in a village or community or lack of indoor plumbing in homes. But the reality is that many individuals living in or around some of the wealthiest jurisdictions in the United States, with some of the most sophisticated drinking water and wastewater systems and infrastructure, suffer from significant access challenges as well. In the fall of 2017, the Environmental Finance Center was asked by representatives from the Global Water Challenge to draft a report on water and sanitation access issues in the United States, which could be used as a framing document for a later workshop to try to create a roadmap for the US to use to work toward Sustainable Development Goal Six. The report and subsequent workshop provided the EFC at UNC with an opportunity to highlight some of the nuanced access challenges we work on regularly, such as affordability issues, infrastructure needs, and the declining capacity of community systems, while also highlighting many of the access challenges regularly in the news, such as contaminated water supplies or drought. 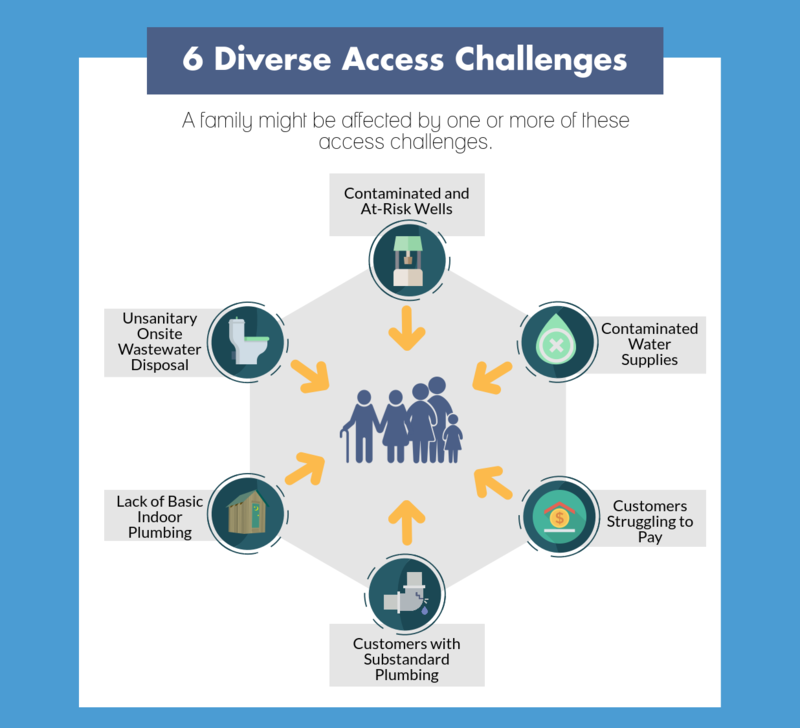 The report, An Overview of Clean Water Access Challenges in the United States, identifies six diverse access challenges that might affect a US family, characterized as either household or community level challenges. One access challenge is a lack of basic indoor plumbing. According to data from the American Community Survey, as of 2014, 1.6 million people in the United States reported that they lacked access to one of the following: a toilet, a tub or shower, or running water. One community that provides a stark example of this challenge is Sandbranch, Texas. Located 14 miles from Dallas, Sandbranch has never had running water in the 138 years since it was established. The residents, only 80 of which have remained, are 97 percent minority and all live below the federal poverty threshold. These types of snapshots help to illustrate the challenges, and spawn discussion on the appropriate solutions. In the early stages of this project, the research team was originally asked to try to link the challenges to specific regions of the country. 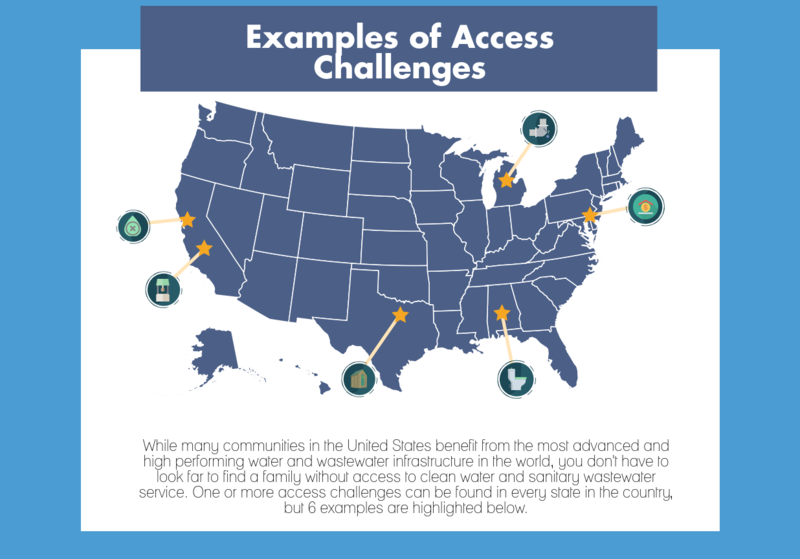 However, while there are certainly hot spots for very specific access challenges, our research proved that the ten access challenges identified in the report are not limited to any specific regions. Communities and individuals all over the country are affected by one or more of these challenges. In addition to the six diverse challenges highlighted above, the report also identifies four future or emerging challenges. These challenges highlight systems vulnerable to natural disasters, systems with declining populations, small systems with limited capacity, and overarching costs of degradation of infrastructure affecting all systems. These emerging challenges are very relevant to our work at the EFC, especially our work with small water systems. The report also addresses the question of how to approach these challenges from a general standpoint, while also pointing out some of the great work that is currently going on to address each challenge. 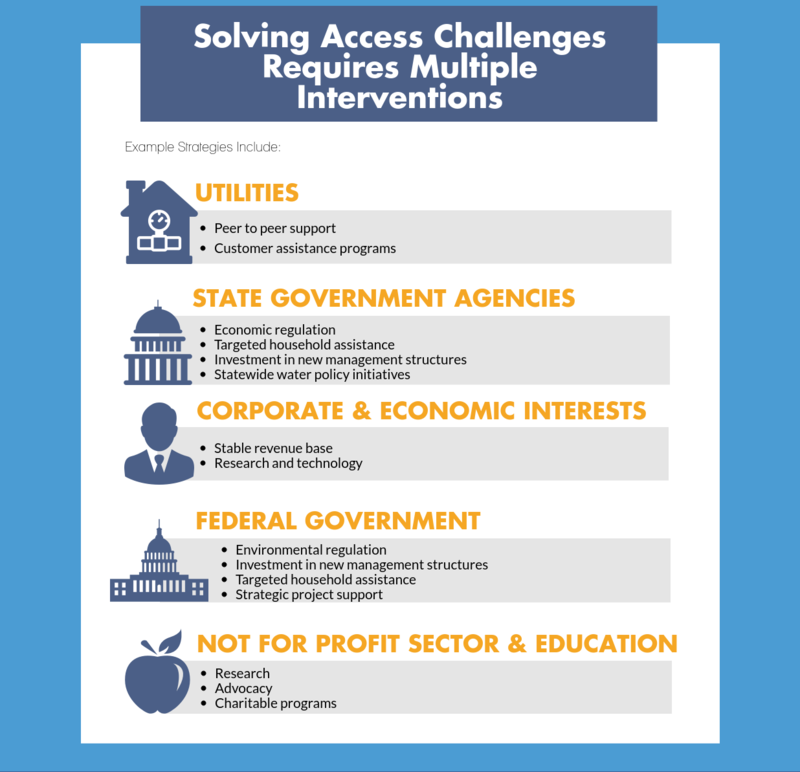 Evaluating the root causes of a specific access challenge helps to identify what interventions are possible to comprehensively work toward a solution. For example, many customers are struggling to pay for water or wastewater services. In some cases, the struggle may stem from the income level of the individual, while in other cases it is a result of exorbitantly high rates at a particular utility. Addressing either of those root problems may start with a utility level solution, such as a customer assistance program that helps to lower rates for low-income customers. Or, where utilities are limited in their ability to implement such programs, the solution might be better addressed at a state policy level through legislation that would allow for rate revenue to be used to fund customer assistance programs. Alternatively, there may be a federal solution, similar to LIHEAP that would help an even broader base of customers with affording rates nationwide. Whatever the approach taken, solving access challenges requires multiple interventions and the participation of many different parties. Utilizing our report as a framing document, the Global Water Challenge, in partnership with UNICEF, the US Water Partnership, and Stanford Water in the West held a workshop November 29-30, 2017, at Stanford University. The workshop included participants from nonprofits, community organizations, private industry, academia, and all levels of government agencies. The EFC at UNC was invited to participate in the workshop and to present the findings from our report to kick off the discussion. After our report was presented, many ideas for solutions were discussed, and many initiatives currently underway were highlighted. Representatives from UNICEF discussed how they are using data to measure and track progress toward SDG 6; organizations working on access challenges on the ground, such as DIGDEEP and the Southeast Rural Community Assistance Project, discussed their approaches and the difficulties and needs of their organizations; representatives from private businesses such as IBM and Kohler discussed the corporate policies and practices they have incorporated to address access challenges; and representatives from government agencies, such as the US Environmental Protection Agency and the Tennessee Valley Authority, explained how the government is working to help craft solutions, both nationwide and regionally. The workshop provided a helpful forum for representatives from all over the country, in many sectors, to offer their input on how they are currently working toward improving access to water and adequate sanitation for more people, and also to think about how they could be collaborating and better refining their role. A roadmap was created to begin the collaboration and to continue the discussion. Stay tuned for what happens next with respect to this important work toward achieving SDG 6. Writing the report for this project and presenting at and participating in the workshop at Stanford was a great opportunity for us at the EFC to reevaluate the state of water and sanitation access challenges in the US. Understanding the state of access challenges helps us to craft our work to be more useful as we support state and local institutions in implementing financial policies and practices that will help them better address such challenges. Customize Your Solutions | The nature of access challenges is as fragmented and diverse as the water service provision models. Improve Your Data | More precise assessments are hindered by available information and data. Partner, Partner, Partner | Successful initiatives almost always involve partnerships. What water and sanitation access challenges are you facing in your community or organization, and how are you working to help eradicate those challenges? Erin Riggs is a legal advisor to the EFC at UNC. She is a graduate of the University of Florida’s Levin College of Law where she pursued a law degree with a specialization in Environmental and Land Use issues. e.g., allow for the use of rate revenue to fund Customer Assistance Programs. e.g., nationwide census data on household sanitation has not been gathered since 1990. I agree with the targeted home owner programs. The question of the the Lead and Copper issue sparks heated debate in many states. The homeowner is usually responsible for the service line from the meter to the home, but the system has the responsibility for water all the way to the tap. These two ideas conflict. Why should the entire system have to bear the cost of Lead and Copper treatment when one or two service lines could be replaced by the homeowners to gain compliance? Flint MI taught many lessons, source water planning was an important one. But I am still conflicted that my federal tax dollars went to improve other people’s internal home plumbing. I doubt that if I asked for new faucets and service lines that it would be funded by other tax payers. I don’t want to diminish the problem that was Flint, but the reaction was overly hasty and costly to the American public. I am all for helping my neighbor, but there is a level of personal responsibility that has been lost here in America. Erin Riggs, thank you ever so for you post.Much thanks again. According to a recently released report from News21, nearly 20% of the United States, or 63 million people across the entire country, could have used an unsafe drinking supply at least once in the past 10 years. Very interesting and informative blog. I must appreciate the way, you presented the blog. Keep writing and sharing your knowledge. Thank you for this post. It is the very informative post. 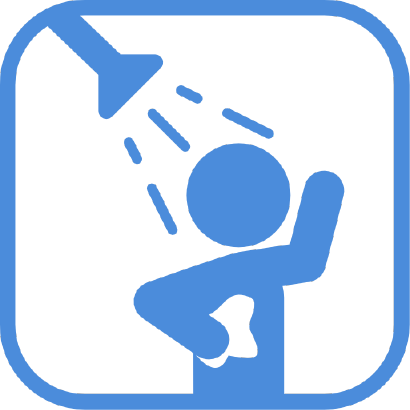 According to data from the American Community Survey, as of 2014, 1.6 million people in the United States reported that they lacked access to running water.